I used to have a serious chicken tikka masala addiction. But it’s one of those dishes that once I learned the recipe (i.e. how much heavy cream went into that luscious tomato sauce) I couldn’t quite carry on life as usual, ignoring the likely cause of all those post tikka tummy aches. So I’ve taken to making my own bastardized version at home. The tweaks are easy, healthy, and would probably make your Indian grandmother wag her Sari in disapproval. But the end result hits all the notes a spicy comfort food should with half the effort and agony. I have a spice rack like the Kardashian’s have an accessory closet. And this gives me plenty of things to pull from when I’m looking to throw together a recipe. So when it comes to my dread of Indian cooking, the issue isn’t not having the ingredients. And it’s not that my living room curtains will smell like them for the next month. It’s more a matter of laziness that prevents me from pulling five jars of seeds and pods in their non-ground form, toasting them in a hot skillet, and pulverizing them myself. And in Indian cooking, the proper treatment of the spices in the process I just laid out is what sets apart real deal Indian cuisine from what you’d get out of some random blonde Jewish girl’s kitchen. But luckily for you, I care more about designing a recipe that’s simple and light than something that hits a home run on authenticity. 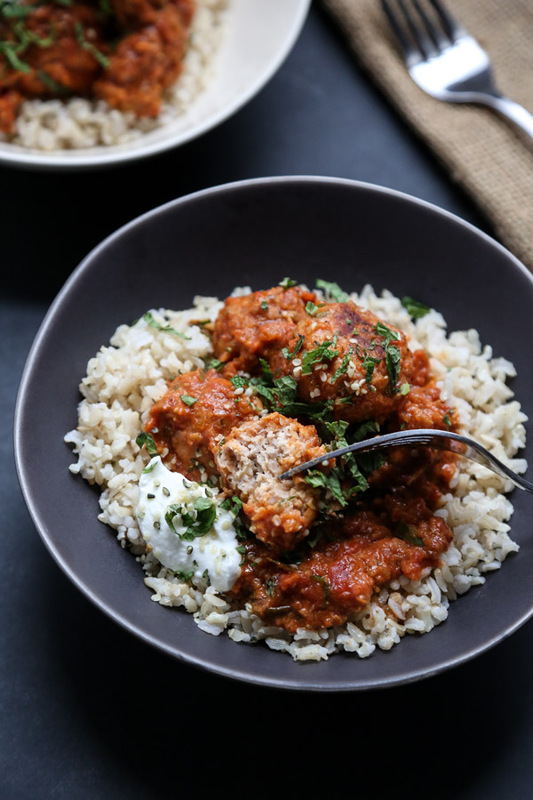 Because these easy chicken tikka masala meatballs come together in 30 minutes and are an amazing weeknight meal. Transforming the chicken from cubes to meatballs cuts down on the labor in and of itself. 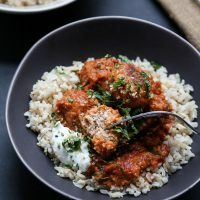 Instead of marinating the bird in a mixture of yogurt, garlic and spices, and then grilling it, you just toss your usual components in a bowl, plus some fresh ginger, ground cumin, garam masala and jalapeno, and form it into balls. 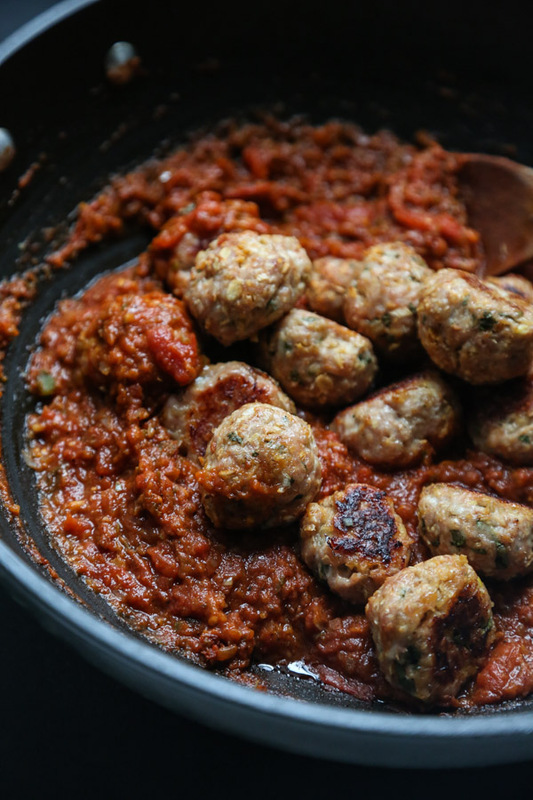 Oh, and of course, I use my favorite gluten-free meatball hack: ground oats. I’m a big believer that anything that takes place in the oven automatically means less clean-up, especially if there’s parchment paper involved (like this brand). So that’s exactly where they head. 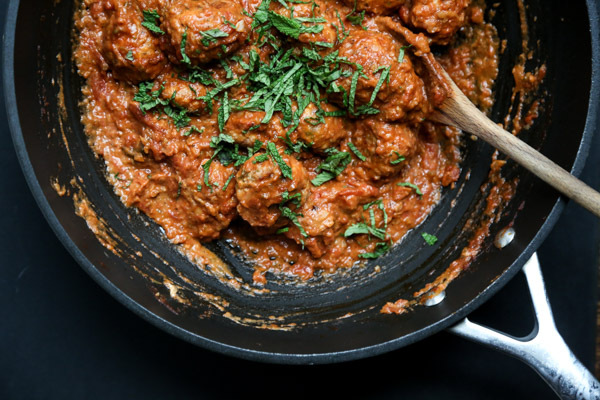 Your classic meatball marinara sauce then gets masala-fied with a lot of those same ingredients. Instead of the heavy cream, I add a few dollops of yogurt at the end. For an even lighter, creamier sauce, you could also add some coconut milk or coconut cream. This is also a great option if you’re avoiding dairy. But I love how the yogurt gives the spicy sauce that slight cooling tang. Best of all: you won’t want to crawl into the fetal position after eating it. 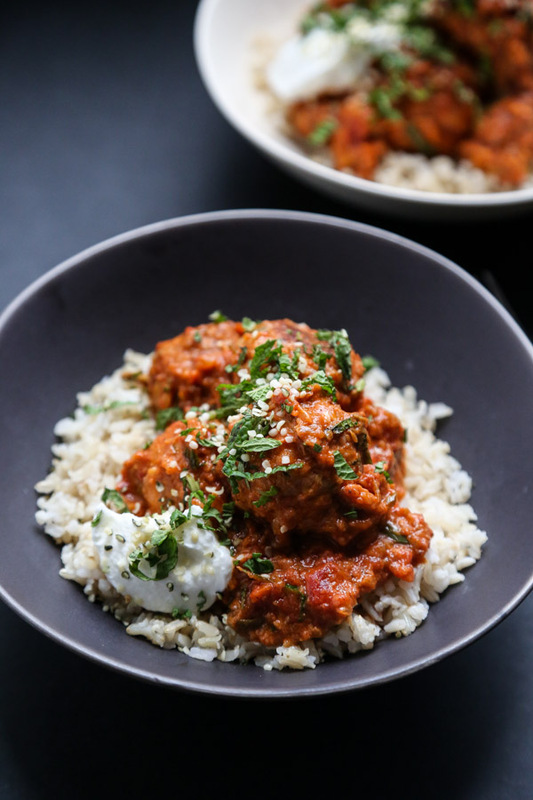 If you’re in the market for some takeout at home that’s a little bit less traditional, I highly recommend you give this easy chicken tikka masala meatball recipe a try. It’s great on top of quinoa or brown rice with a little more plain Greek yogurt on the side. Or you could get really crazy and fusion and serve it over noodles. Speaking of fusion, I’m in LA this week, and therefore will be taking a break from Indian food to eat my body weight in tacos and sushi. Pop over to instagram if you want to see what healthy hedonistic things I’ve been taking down! And if you have any recommendations on the next candidates, please share your food recs with me in the comments section! 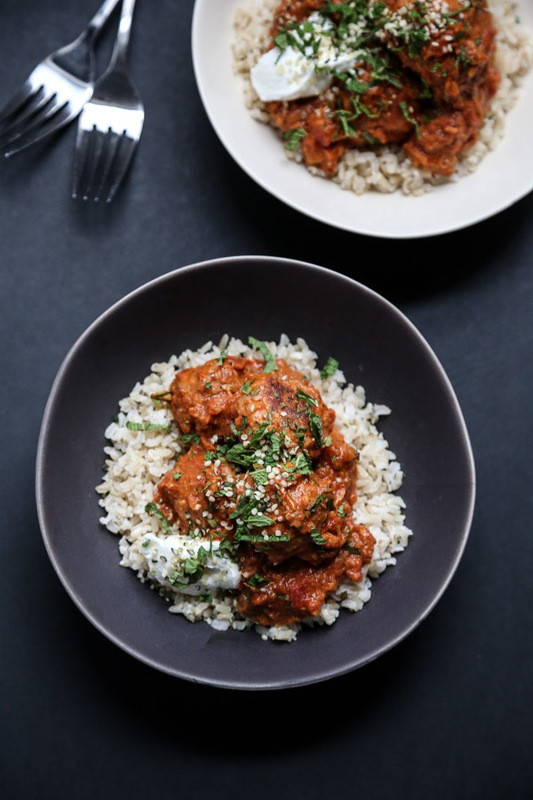 This easy chicken tikka masala recipe turns the Indian classic dish into meatballs! It's gluten-free, healthy, and uses yogurt instead of heavy cream. In a large bowl, combine the ground chicken, egg, tomato paste, olive oil, mint, garlic, shallot, ginger, cumin and salt. In a small food processor, pulse the oats until coarsely ground. Add to the bowl. With clean hands, mix the chicken with the other ingredients until loosely combined. You don’t want to overly break up the meat. Form the chicken into 2-inch balls (an ice cream scoop works well for portioning) and roll in your hands until round and smooth. 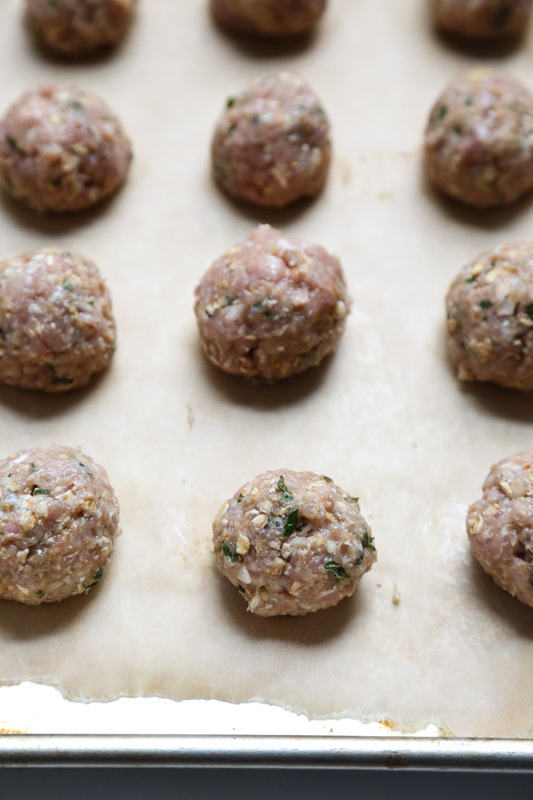 Arrange the balls (you should have 16) on a parchment-lined baking sheet and bake in the oven until cooked through and beginning to brown on the bottom, about 20-25 minutes. Meanwhile, make the sauce: heat the coconut or olive oil in a large skillet or saucepan. Sauté the shallot, pepper, garlic and ginger over medium heat until soft, 3 minutes. Stir in the garam masala and cumin. Cook two minutes more until very fragrant and paste-like. Carefully pour in the tomato sauce. Simmer until thickened and the flavors have melded, 5 minutes. Off the heat, fold in the Greek yogurt. Taste for seasoning and add more salt or a pinch of cayenne if you like it spicier. 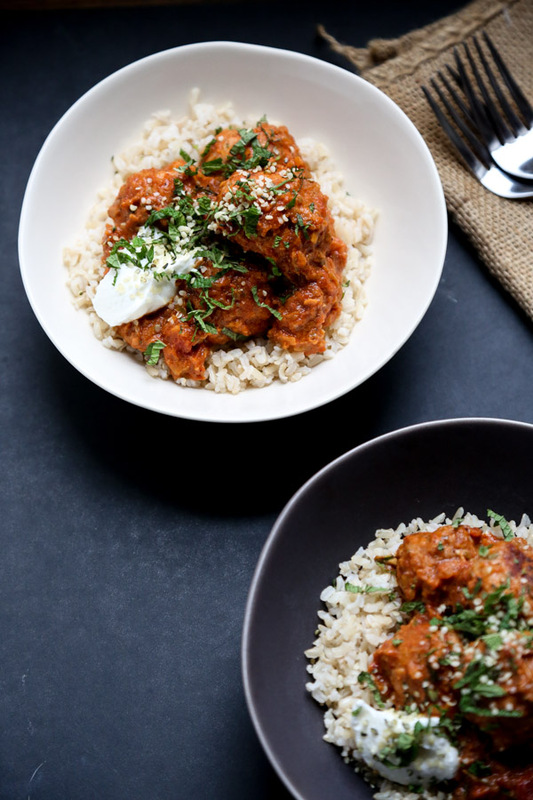 Toss the chicken meatballs with the tikka masala sauce and serve immediately over brown rice or quinoa. Garnish with extra yogurt and chopped mint. 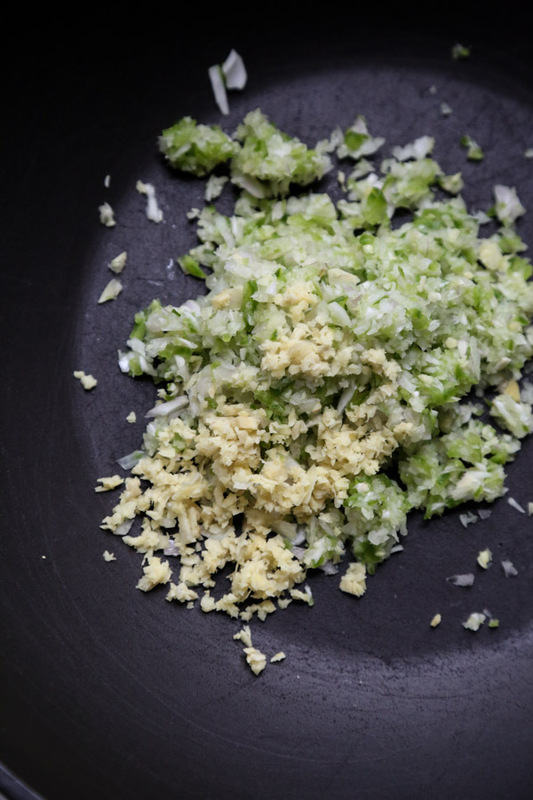 If you don't want to mince everything by hand, after pulsing the oats, you can mince the garlic, shallot, and ginger in the food process to make your life easier! Wow. Garam masala and Greek yogurt. You can’t go wrong with that:) Such a fantastic version of the Tikka Masala, thanl you so much Phoebe! You have such a talent, to transform and adapt classic dishes to a healthier version, we love that!